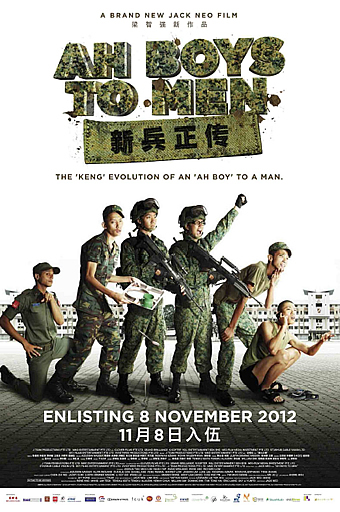 Synopsis: Ah Boys to Men 3: Frogmen brings Singapore’s favourite recruits back to the days before enlistment in ABTM. Instead of reporting to Pualu Tekong, the Ah Boys are posted to the Naval Diving Unit (NDU). Returning to active duty are familiar characters ? Ken Chow (Joshua Tan), the spoilt, rich kid, who tries to 'keng' his way out of NS. Aloysius Jin AKA Wayang King (Maxi Lim), whose over-enthusiasm creates more problems for his cabin mates. Lobang (Wang Weiliang), the street-smart wheeler dealer, out to make a quick buck off his cabin mates. Joining them is new face Hei Long AKA The Black Dragon (Wesley Wong), an aggressive gang leader, who prefers to talk with his fists instead of his mouth. Together, these ragtag band of misfits must somehow survive 40 weeks of training in hell. Do they have what it takes to become one of Singapore’s most fearsome military units ? the frogmen? What if, instead of Basic Military School (BMT) in Pulau Tekong, our favourite recruits were selected right from the onset to join the elite Naval Diving Unit (NDU) and underwent a forty-week training course to be frogmen? 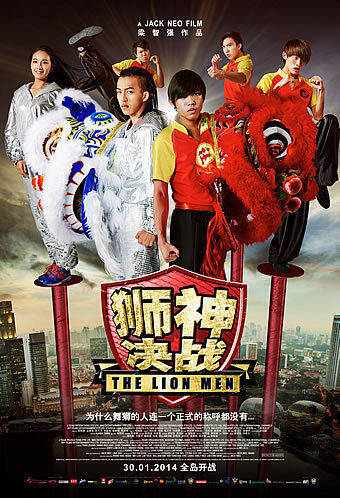 That, in a nutshell, is how Jack Neo has set up this third instalment of the highest-grossing franchise in local movie history. Yes, other than the fact that it largely bears the same group of characters we’ve come to love (or for some, hate) from the first two movies, there is no relation whatsoever with the earlier duology. 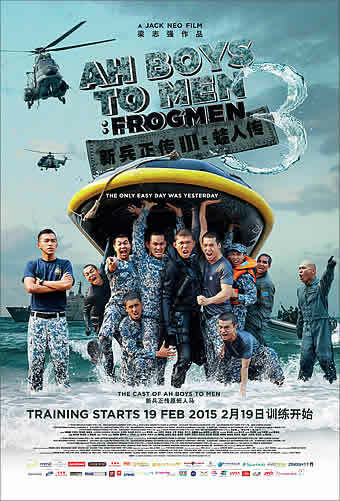 Cynics who’ve never loved Jack Neo and his movies will certainly see this as a money-spinner, but ‘Ah Boys to Men 3: Frogmen’ is a surprisingly entertaining alternate story that stands on its own merits. Chiefly, the decision not to split this movie into two – which explains its two-and-a-half hour runtime – is a wise one. Skimming over the Boys’ requisite BMT training, Neo focuses instead on the land, sand and sea training in the weeks after that is unique to the NDU, including tyre flips, overhead boat push-ups, boat tosses (where a crew of eight men throw the boat into the air and catch it on the way down), flutter kicks (on land and at the beach), drown proofing, capsize drills, fins swimming, sea circuit training and culminating of course in the infamous Hell Week. As much as this is unabashedly a Public Service Advertisement for the Republic of Singapore Navy (RSN) in its fiftieth year, Neo doesn’t prettify any bit of the gruelling “baptism of fire” that every frogman has to go through. Yes, no one has so vividly captured the physical, mental, emotional and psychological endurance that is required of each and every NDU recruit, and Neo makes full use of the unprecedented access he has obtained to the NDU’s actual training premises in Sembawang Camp to portray the unit in all its sweat and tears and glory. That same commitment to realism also extends to his cast – much has been said about how Neo has insisted that they experience the training for themselves, and indeed there is no CGI used (or needed) in displaying the transformation that his actors have undergone after being through weeks of the very same training as the characters they play. It is quite an amazing transformation to watch – and not only do we emerge at the end of it with respect for the characters but also for the very actors portraying them. Like the first two movies, Neo juxtaposes their transformation within the camp and that outside the camp. For the large part, the characters are pretty much the same as the ones they played in the first two movies. Wang Weiliang’s ‘L O Bang King’ is still the street-smart kid who knows how to make the best of his circumstances – and that means running a small ‘minimart’ business in camp selling snacks to his platoon mates. As a testament to Weiliang’s rising stardom, Neo gives his character much more depth and scope than before – indeed, Weiliang’s struggle to support and protect his sister from his drug-addicted mother comes to an unexpectedly emotional conclusion that ties in beautifully with a poignant display of humanity by his superiors, Alex (Tosh Zhang) and No 2 (Justin Dominic Misson). Joshua Tan’s Ken Chow is still struggling with girlfriend issues and looking for ways to ‘keng’, but (thankfully) there is no sob story here with his father (Richard Low) or for that matter his fastidious mother (Irene Ang). Maxi Lim’s Aloysius Jin (or Zeng Xia Lang in Chinese) is still the annoying eager-to-please smart-aleck, but he wisely chooses to underplay than overplay his character’s more ingratiating qualities this time round. Tosh’s Sergeant Alex Ong remains tough but fair, and a much more nuanced character here in how he responds to Ken’s ‘chao keng’ behaviour vis-à-vis ‘Lobang King’s’ unusual request to book out to attend an urgent family matter late at night. Instead of re-playing the initial hostilities between ‘Lobang King’ and ‘Wayang King’, Neo introduces a new character in Hei Long (Wesley Wong), a new citizen from Hong Kong whose triad roots there have propagated into similar ties with the street gangs in Tiong Bahru. Through a series of unfortunate run-ins, Neo builds the conflict between the two that leads to an undeniably mawkish but nonetheless effective confrontation that earns our sympathies for both characters. As they have demonstrated in the last two movies, the cast are Neo’s strongest hand. Weiliang has perfected his ‘ah beng’ routine of mixing brashness and vulnerability, and proves himself again to be a truly versatile and natural performer. Tosh may be the same age as the recruits he presides over, but he yet again displays a commanding air of authority and an admirable sense of justice. Thrust into a much bigger role here is Misson (he was the ‘crazy’ warrant officer in ‘Ah Boys’ in the 70s showing how life was much tougher then) as the notorious ‘trainer from hell’ – so convincing is his tough-as-nails getup that we found it hard to distinguish the actor from his character, and that he isn't in fact an SAF regular simply playing the same part in the movie. Neo’s keen eye for casting has occasionally been undermined by his self-indulgent tendencies, but thankfully that’s kept to a minimum here. His fascination with modern-day CGI manifests itself only once – and briefly – when ‘Lobang King’ recounts how he envisioned the NDU’s iconic ‘frog with wings’ statue make a leap into the sky and into the sea when trying to sneak out of camp. He also emphasises the drama rather than the melodrama, in particular the drama between and within the recruits through the weeks of training. His play on common words, phrases and acronyms is at its sharpest in years – and amusing asides like how NDU is abbreviated to be ‘Night Delivery Unit’ or how ‘hum ka chan’ actually means humble and garang largely hit the right notes. The structure of the NDU training itself also imposes discipline on his storytelling, and this is probably one of his most coherent and tightly knit films in recent years. 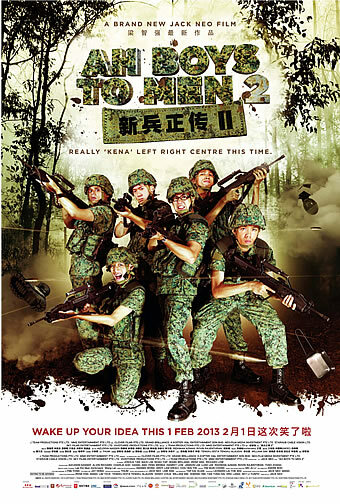 Much as we thought the ‘Ah Boys to Men’ franchise was done and dusted with a drama series and a musical following the two-part movies, Neo has proven that there is plenty of mileage left in the story of a ragtag group of misfits going through an indelible journey in every Singaporean male’s transformation from teenager to young adult. Though he opens with a thrilling rescue by the NDU of a cargo vessel overtaken by pirates, it is in these endearing NS character archetypes and their individual, as well as collective, rites of passage that ‘Ah Boys to Men 3: Frogmen’ truly resonates. Not just because of its theme, but also because of its treatment, its humour and its drama, we dare say you won’t find a more relevant Singaporean film this year.